Khurshid discusses her contemporary hanging ‘Karachi Windows and Doorways’, a reminder of her homeland. She talks about her passion for fabric and threads, using a wide range of techniques for dyeing and discharging fabrics, to create unique pieces some of which have been exhibited in the UK and internationally. Quiltmaking has given Kurshid tremendous joy, fulfilment, peace, happiness and frustration, and she cannot imagine life without the creative outlet and friendship it provides. Later in the interview she discusses traditional approaches to quiltmaking, developments in threads and equipment and quilts made for grand-children. 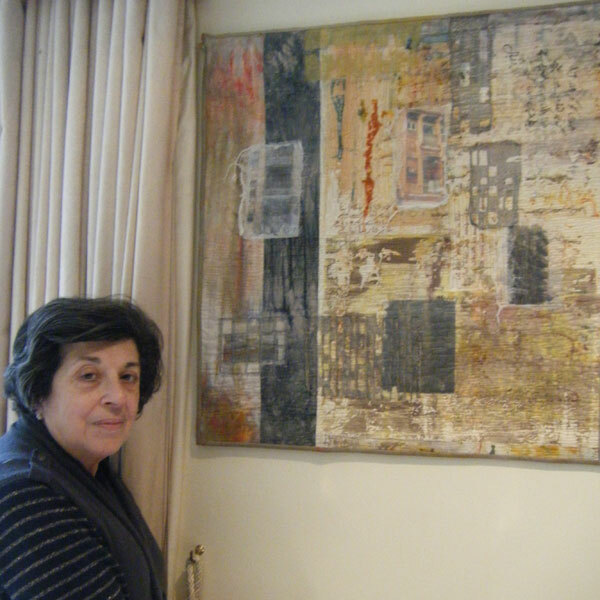 Alice Sage [AS]: So, this is an interview for talking quilts TQ.2015.0101 between Khurshid Bamboat and Alice Sage recorded at Khurshid’s house in Dulwich on Monday 19th January 2015. So, Khurshid, when I sent you the questionnaire you weren’t sure what quilt you wanted to talk about but you’ve chosen one. AS: Could you tell me about it? KB: Well it’s called Karachi Windows and Doorways. I was born in Karachi but I’ve liked in England virtually all my life but I went back just before I did this in 2001 for a friend’s wedding and took lots of photographs. More of the old part of Karachi, not the new part of Karachi, it doesn’t really interest me, because it has no, no interest for me because it’s come much after I left, but the old parts of Karachi are the ones that I can remember as a child and the doors and everything are quite beautiful, despite them being completely… distressed, I mean the more distress is much nicer to me and so I took a lot of photographs while I was there. And then much later on, a few years later, by which time I had begun to do my own dyeing and printing and discharge and various other techniques with Committed to Cloth, I decided that this was something that I wanted very much to do, to depict a hanging which belonged to my roots and at the same time I was doing a course about how to work in a series with Charlotta Yde from Denmark and this is the one that I decided to go with so it’s very special. I’m very fond of it as well. AS: So could you talk me a bit about the techniques that you’ve used in it and how you’ve got that idea of doors and windows to a beautiful quilt that it is now. KB: Mm. Well, there are three different pieces of fabric there. The two on the, the one on the extreme left and then the middle one are both dyed and they’ve been dyed in a particular way by scrunching up the cloth and then pouring the dye over it, which is why they’ve got sort of different colours and textures and wrinkles. The one, the biggest piece was I think was the piece that I did at breakdown printing which is a completely different type of printing whereby you put dyes onto a screen, you let them dry out and then you get, you screen them onto your prepared fabric. You don’t always know what you’re going to get which is half the fun of it but, and I’m sure if I tried to do it again I would never get the same colours. 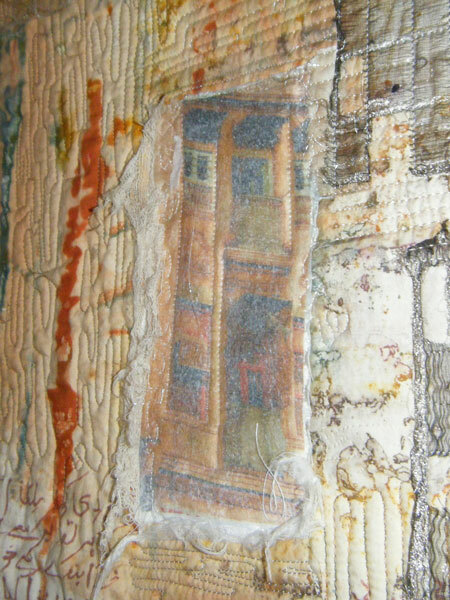 And then on top of that I’ve done image transfer of some of the windows and doors and then a scrim put on top of it, just to sort of deaden it a little bit and make it a little more distressed. 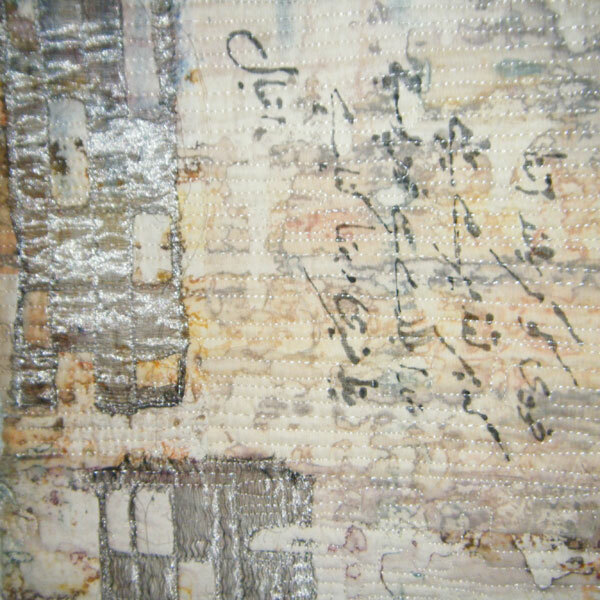 There’s also organza over some of the photographs and again, I played around and made holes in it which was great fun. So basically it’s just, it’s showcasing what’s happened to these old buildings, the decay, the sort of barrenness of it and yet there’s joy in the entire hanging. For me it’s joy. And then I got a friend ‘cos I thought, well writing’s great, I love writing and I love the calligraphy and the Islamic calligraphy is absolutely beautiful because the actual script is so beautiful. And I got a friend of mine to write a part of a poem by one of the famous poets called Iqbal and it’s my handwriting but she sent it to me and then I copied it and then Charlotta said ‘Oh, why don’t you just write it directly onto the fabric?’ which was quite difficult but it worked. AS: There’s several areas of text. Are they different [KB: yes] parts of the poem? KB: Yes. They are, there are two different poems. There are two different, well they are two different verses from the same poem, they’re not different poems. They’re both by Iqbal. AS: When did you make this quilt? KB: It was made in 2005. Yes. And where it hangs, it’s a very convenient place because I’ve got quite a few hangings that are the same sort of size so I can rotate them which is quite nice. AS: Have you exhibited this quilt elsewhere? KB: Yes, it was exhibited at Dulwich quilters which is my local group and I think that’s about where, that’s the only place it has. I can’t remember whether I sent it to Festival of Quilts, it may have gone there before Festival of Quilts had the new ruling that you had to have, any piece had to be over a metre in any direction and this certainly isn’t, it’s quite a small quilt, but it works. There was supposed to be a series but I’ve done this one and I’ve done another one which is not the same size and that was definitely shown at Festival of Quilts ‘cos it’s a bigger piece. AS: You mentioned a few types of dyeing and printing that you used [KB: yes] in the process. Did you dye these fabrics especially for this quilt in mind? [KB: No, no] Or was it separate? KB: I’d already got them and took an enormous amount of fabrics to the workshop and Charlotta helped, well, she suggested that these would go well, and they did. And I think it was also because of the window there in the middle of the hanging blends in so well with the background fabric. AS: It emerges, doesn’t it from the [KB: yes] patterns. And then what about the quilting at the actual quilting itself? KB: Well, there’s all varieties of quilting. It’s all machine quilted. I don’t think I’ve put any hand quilting on so, yes, it’s quite densely quilted. I don’t think you can see how much quilting there is unless you go quite close to it but there is quite a bit. AS: How did you plan that? How did you…? KB: The quilting? [AS: mm] I think I started at the bottom and just wanted to sort of make it denser at the bottom because it’s supposed to be doors and windows and… I just, I think the fabric spoke to me, or rather the quilt spoke to me. I just had fun quilting it. Every time I looked I thought ‘oh yes, I can do a little more’ so, but it’s all different quilting. You know, it’s as whatever, whatever sort of took my fancy or I thought of ‘oh let’s try this!’ I’m not a good machine quilter, I’ve never pretended to be but I do try. AS: What are the different skills that you need between quilting on the machine and quilting by hand? KB: Well, quilting by hand – years ago – I’ve broken both my wrists sadly so I can’t quilt as tiny as I used to by hand but years ago they used to always say that you had to have x amount of stitches per inch, I think it was something like twelve stitches to an inch. That was the answer to being a good hand quilter and you had to learn how to rock your needle. Well, all these years later I still can’t rock that needle. AS: What does that mean? KB: Well, your sort of hold the needle and you put the end of the needle onto the pad of your third finger and you rock your wrist back and forth and your needle should go in and out, in and out of the fabric at this same time. You’re supposed to be able to take three or four stitches before you pull it. It’s no mean feat, I can assure you. So, yes, I still like hand quilting, I think I’ll always there’s, you’ll always like hand quilting. Hand quilting is completely different to machine quilting. Machine quilting has taken over and you know, some of these people who can machine quilt beautifully like Philippa Naylor and June Barnes, to name just a couple, their quilts are beautiful. There’s nothing wrong with machine quilting. The people who poo poo machine quilting are wrong, I mean there’s a place for both. And you can use both. I use both of them in quilts, I hand and machine on the same hanging with great pleasure. AS: Who taught you to make quilts? You said about rocking the needle, where did that come from? KB: Oh, well, we had an American lady in Dulwich Quilters, she was one of the founder members and she was an American and totally… she was an amazing lady, she really was. Sadly she died in 2004 and she was the most… you could just sort of be mesmerized the way she used to rock her needle and she did rock that needle beautifully. I don’t think she ever machine quilted. I’m not sure, but I don’t think she did. She machine pieced but I don’t think she machine quilted. No, Adele was an amazing lady. She was unique. So that’s how I know about the rocking, but I knew about rocking the needle because if you read any quilting books or talk to people, they’ll tell you about that, you know. It’s a term used for how you hand quilt. AS: There’s one of the questions I was going to ask you further on was about Dulwich Quilters and how that inspires you or helps you to talk to other people and you suggested then what it was like with Adele. 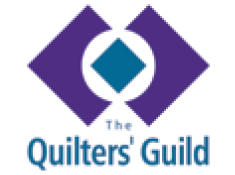 How long have you been in Dulwich Quilters? AS: And how has it affected your quilting? To be part of a group? KB: I don’t think it’s affected my quilting to be honest. I think going to my a day-a-month with Committed to Cloth has affected my perception of dyeing and using different techniques. I do like being part of Dulwich Quilters. I could say some things, but I won’t being recorded. AS: Save it for after! KB: But we’re a very international group of ladies. We’ve got me, a Spanish lady, Brazilian, Canadian, Adele was American, we’ve had Dutch, so a variety of nationalities. And I think it makes for a very versatile and entertaining type of group. We’re only twenty-five, well we should be twenty-five active members but we’re not twenty-five, twenty-three active members but it’s, I have to say that we probably put one of the most professional looking exhibitions every two years. I do the catalogue and the publicity and nag them to get their entries in properly. So, it’s come a long way. It has. Next year, in 2016 it will be their thirtieth anniversary so they are doing really well. And of course in all groups you are never going to get plain sailing. You know [laughs] if somebody says that people don’t have arguments then they’re not being honest! There’s no harm in arguing. 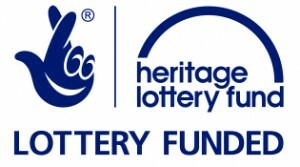 We have the AGM tonight so [laughing] you can imagine what’s going to happen there, especially as we had our exhibition last November, so this is the first meeting since the exhibition where people will discuss the ifs and the buts and the whys. AS: Mm, mm, so but Committed to Cloth is a different, it’s more of a workshop? KB: Oh yeah, no, Committed to Cloth is Leslie Morgan and Clair Benn. They started this in 2002 and basically we used to go there to, I used to go once a month, and we learned techniques sometimes, but mainly we did our own, we just used their facilities, which were great, and we did our own work. But thanks to them I learned that printing was great fun, and that discharge was even nicer! And, you know, I’ve got so many techniques under my belt which I have to thank them for because if I hadn’t gone to them and learned how to do it I would probably never have done it. AS: And how does that change your quilt making? AS: Could you say a bit more about discharge and what that process is? KB: Well it’s basically taking out the colour. So you can, you make up a solution which really is not particularly nice to smell but it’s not as bad as some of the things, it’s not bleach, it’s a special solution that you make up and you use it, you can screen with it, you can stamp with it, you can write with it. You let it dry and then you activate it with the iron and depending on what you use you could get pure white, you could get a funny colour, you could get a hideous colour, just it’s really, it’s one of those things, you just don’t know. And then you could paint over it and get another colour and then discharge it all over again and see what happens. So it’s a never-ending cycle of discovery, it is, it’s a voyage of discovery. And as long as I can discover and enjoy it I’ll carry on. AS: It’s nice you say about it’s… things are really unpredictable, ‘cos quite traditional quilt making, it’s a lot of planning [KB: sure] and things are quite predictable [KB: yes, yes] so you’ve, you’re doing something that is quite different. KB: Well, yes, most of the people in Dulwich Quilters are quite traditional in their… using their blocks and what have you. And I used to and I don’t mock it, don’t get me wrong, I think there’s a place for American blocks, paper piecing, good old Country Garden, all that but they’re very static. Unless you take a block and really give it a twist like some friends I have do. They take a traditional block but they’ll give it their own particular twist to it. There is no movement unless it’s a block like Snails Trail or one of those which has the movement because they turn and twist, but so many of the blocks they’re just there, solid. I think I’ve come away from that. I do like certain blocks like the good old nine patch. There’s so much you can do with a nine patch, it’s wonderful, it’s got so many possibilities. But see, years ago, and again they’ll probably kill me for saying that I always used to think I’d do a Baltimore quilt, because I thought they were just amazing, they’re so pristine and different blocks and the curlicues and everything. I would no more do a Baltimore quilt than bungee jump. Seriously. I find them completely, sorry ladies, completely boring and static. AS: Say, could you explain more what a Baltimore quilt is? KB: Well it’s very American, so each block used to be with some fronds of feathers and flowers in sort of very stilted vases and things like that. Things that are beautiful and they do them beautifully but there’s no soul to it. And I think that’s the main thing. I like hangings that have a bit of soul. AS: It would be quicker to do a bungee jump! [Both laugh]. KB: Possibly, but I’m not going to bungee jump, I can’t bear heights. I feel that all my pieces, every one of them, be they small or large, all have a bit of me because I’ve given my all to all my pieces. KB: No, I wish I was! I wish I was that disciplined. I’m terrible, I’ll go from one to another and then I’ll go to a third one. But usually now I try only to have one big project and have baby projects on the back burner, but no. AS: What would be a baby project? KB: Well, I’d, I’m part of the Contemporary Quilt Group and we do Journal quilts, the journal quilt challenge and I’ve done it every year bar one. Those are little baby projects because you’re supposed to do one quiltette a month. The new challenge, and I was reading it before you came. The size of the little quilt is supposed to be I think, I can’t remember. It’s eight by twelve or six by twelve, something like that. So you, last year I actually thought about it properly and I did all mine that they would be all put together as a whole in the end. So from twelve little quilts or little pieces I managed to sew them together and produce one hanging which hung at Dulwich Quilters which I was very, very pleased with. And I’d based that entire thing on the runic alphabet because I’d been to the British Museum and seen the Vikings, so decided I would do something completely different and a bit wacky. Sso I was very pleased with the result. I’ll show it to you afterwards. AS: That sounds beautiful. Was that the other one that you considered? KB: No, no I never thought of that actually because there’s not much you can talk about that, no. I like doing different things. I want to push myself as far as I can without falling over the edge. AS: You said about going to the British Museum and getting inspiration there and then your travels and going back home and inspiring the doors and windows quilt. Are there, what other things inspire you? Drawing? KB: I’m not a drawer. I take photographs and then sort of look at them. I do like distressed things. We went to Botswana the year before last in the winter. And everyone was absolutely curious and slightly amazed that I spent most of the time when we were on the jeep shouting to the driver to stop. Not because I’d seen an animal but because I’d seen a particularly beautiful withered tree and they all got used to me, they [laughs], he used to stop and say ‘photograph?’ and I’d say ‘yes, please!’ so I’ve got some amazing photographs of wonderful trees but how I’m going to use them I haven’t decided yet. And I absolutely loved the sunsets and sunrises but again, I’m not really a landscape quilter. My friend is, she does the most fabulous landscape quilts but I just admire them. I love the colours. I hope I can use the colours in something and abstract it. I’m better at abstract quilts than very visual proper quilts. AS: The way in this one that you’ve used the photographs brings that representational aspect in but then the quilt, I don’t know, it expands on the photographs somehow? [KB: I guess] It draws things out of them. KB: Well it’s inviting you to go in and look a little closer. I think I achieved what I wanted which was to show the slight crumbling because the background also looks a bit crumbling, especially the bit on the far right because of the different colours. No, there’s a lot in that quilt, I mean I’ve been looking at it for years and even now I can sort of look at it and think ‘yes, I do like that little bit’. I wouldn’t be able to reproduce it again. AS: What particular things is it that you like? KB: I don’t know, the colour’s lovely. It’s very sort of representational of the East ‘cos you get the yellow and the brown is the colour of the desert so, yes for me, it can evoke memories of that feeling of sand, the heat and even the smell of the East, but then I know it so… it’s different. There’s, if you have to really look at it properly and then you’ll see all the different, there’s more than just the two apparent pieces of writing. There’s writing in other areas, I’ve even translated it in English in that little bit that’s machined is, I’ve written it in the translations there, part of it. So. But it’s very much a personal piece as well as it looks nice to the viewer. It’s personal to me. AS: Have you done any other quilts that are autobiographical in that way? KB: Well yes, the other Karachi one, the other Karachi one called Summer in the City because that was The Quilters’ Guild Challenge a few years ago and I had this beautiful piece of silk which reminded me of the sea and so again I photo image, image transferred various photographs but this time on silk as opposed to cotton. And it’s a much bigger quilt so that tells a completely different story. That’s more views of Karachi as well as, well they were my personal views but they’re… there’s a donkey and a camel and of course I’ve managed to put my nephew’s sailing boat in there, so there’s lots of personal aspects as well. And that sort of charged around the world a bit. It’s gone to the States and last year it was in the Hidden Histories exhibition so it’s done a fair bit of travelling. KB: What the travelling? Well Hidden Histories again is part of The British Quilters’ Guild of the British Isles so they invited quilters to submit something which had a hidden history, so I sent them a photograph and they accepted it. And then it sort of went to a couple of, you know, local exhibitions in the British Isles. The American one is part of Christine Porter. She organises quilts from the United Kingdom to be sent to the States under the umbrella of the Mancuso Brothers which is, I’m trying to think, it’s called World Quilt Festival and you send a photograph, digital, and if they accept, they accept and then you send, everyone sends their quilts to Christine and she organises them to go to the States and then sends them back when they’ve finished. They normally sort of chugging around for a year or a year and a half. [AS: in different exhibitions?] Yes. [AS: That’s fantastic] Yep. KB: Well yes, Christine normally tells us the venues but that’s about it. So yes, quite a few of my quilts have been travelling around Europe and the States which is rather nice. Makes you feel good. It’s a real ego boost! AS: So you’ve said already about how your style has changed and the kinds of quilts you are making. How did you start out quilting and what was the beginnings of that? KB: Ah the first thing I made was, besides doing little things, was a sampler quilt. I did it with an American lady and used to travel every Monday to Swiss Cottage. We used to sit in her house and she used to have sheets of paper with different blocks and we used to have to sit there with cardboard and pencil, and trace out the patterns and cut the cardboard and then draw round it on fabrics. This is all pre rotary cutters and cutting mats and all the exciting things that people have now. It was just, when I think how we used to do it, it was quite amazing! But, you know, good fun. You learned and it was my sampler quilt was all made by hand, every bit of it. It’s all pieced by hand and quilted by hand. And it’s a king-size quilt so, there’s thirty-six blocks in there, and sashing and goodness knows what else. Yes it was a real feat and it’s on my bed, even now. I need to change it, I need to get another, make something new because it is getting a bit sad. KB: Yes I’m afraid I jumped [AS: you went right in] [laughs] right into it, all or nothing! So that was my first piece so yes, I did traditional. I help some ladies who used to, we used to have a quilt group. We started a quilt group at St Christopher’s Hospice a few years ago. The chap from St Christopher’s had seen our exhibition. In fact we, our quilt was raffled in aid of St Christopher’s, so then he asked the then chairman whether she’d be interested in starting a group at St Christopher’s and we did. And then they didn’t want us anymore, that’s another story, so we left and some of the ladies who wanted to learn more, more techniques rather than just going for the social aspect came with us and we still meet every Wednesday evening and they’re being taught different things. So, it’s nice. It’s nice to be able to pass your knowledge to somebody who’s eager to learn. And no, don’t get me wrong, I wouldn’t knock traditional quilts at all. I think they’re always going to have a place. And if you look at any of these quilt exhibitions the one that normally wins the Best of Show more often than not is a traditional quilt. AS: Why’s that do you think? KB: I think there’s something quite… I don’t know, sentiment or they like the workmanship or it’s safe. For whatever reason. And it’s usually a bed quilt so, a bed quilt is something very functional and quilts were then, were made to be functional items, not to be stuck on walls as they are now. Again, don’t get me wrong, I’m glad they are because I think there’s nothing, there’s no rule that you have to have canvas on your walls, as art, you can have fabric. AS: It reminds me of the Medieval Palaces. They were all had tapestries and embroideries [KB: absolutely] it’s all around. KB: Sure. So no, I think everyone should learn traditional piecing and you learn the rules, then you can break them. AS: Did you do needlework of any kind when you were a child? KB: Yes. Yes I did. My mum and my aunt were both very good needle people. Neither of them were quilters, I’m the first quilter in the family but they were both great needlewomen and I learned the famous stem stitch and what I call, well we were called, it was called lazy daisy in those days, now it’s much posher by calling it detached chain stitch but, yes, and I’ve got my City and Guilds in embroidery. AS: Was that before you did quilting or were you doing it at the same time? AS: Did you have children [KB: two daughters] at that time? Were they still young? KB: Yes. Yes they were about seven and nine. Yes. AS: How did you find the time? KB: [Laughs] Well I did! They were very good poor things. They really were good. ‘Cos it was only, I only went to the class, I think it was one and a half days that you went for the part one first year. The second year I think we only went for one full day. And then for part two we went for one full day. But you had lots of homework. I mean masses of homework but when you’re young you can do it. And it was an experience, it was a very good experience but I didn’t want to do City and Guilds in patchwork and quilting, one City and Guilds was enough. AS: Has your family been supportive of your creative textiles? KB: [Laughs] Well I think they have, yes. I mean secretly I think they are quite pleased about it. I think they get fed up of having to step over clutter and bits of fabric. And even, we had a cat and even she knew how to tiptoe over things, she was wonderful, she loved the, she had her own quilt. She had her own quilt on her bed, in her basket and she used to love it when I had my quilt out, she’d come as a little kitten she used to hide in the quilt and I’d have to pull the quilt up to try and find her, so yes. There’s something very comforting about a quilt. My two grand-children have a quilt each from me and at Christmas I made them both a quillow, so they’ve got that now as well. AS: Where do you do the quilting? Do you have a space in the house? KB: [Laughing] I do it here, right here in the drawing room because otherwise if I disappeared my husband wouldn’t see me for dust! I’ll be, you know I’d never appear so no, and also this room’s the largest room, it’s the lightest room and the warmest. So it’s got everything so it’s usually here. If I’m doing anything by hand I just sit on the sofa and quilt on it. But I think that’s one of the nice things about quilting if you’re doing it in pieces you can sort of take it around with you. It’s quite moveable. When I used to do my… when I did my sampler quilt I always had some of it in the car while waiting for the children from one of their activities and I’d sit there. I couldn’t do it now! In those days, yes I used to sit on behind the wheel and merrily sew a few stitches here and there. All these things have changed so much, I mean, yeah. I’m sure if you spoke to someone even more older than me they’d say things were even more different so it’s always going to change. AS: What do you think’s changed so much between when you started and now? If someone was to start now? KB: Well first of all you’ve got the rotary cutter and the rotary mat and all these gadgets that help you cut accurately. You’ve got the sewing machine with the half, quarter inch seam allowance foot. Again you don’t have to sit and work out where your quarter inch is like we used to have to put tape measure and make holes and stick sellotape and other horrible things on your machine so it’s all changed. Wonderful threads, we didn’t have all these threads when we, thirty years ago, you didn’t have all the variety that you have now. KB: Well, I think the colours are far superior, far larger in quantity than perhaps even twenty years ago and the amount of thread companies that have come up. I mean I think that when I started there was Silco and Coates and Madeira I think, they were probably, that was it. Now every few months you hear of another company. Not as sort of far reaching and popular as some of the other ones but you know there’s Wonderfil from Canada, there’s Sulky and I admit I do like looking and trying out different threads, I have more threads than I will ever use in my lifetime and more fabric than I will ever use in my lifetime but that doesn’t stop me I’m afraid. I still enjoy looking at threads. AS: Where do you go to buy threads and fabric? KB: I don’t buy fabric that much. I buy white and I buy black because I dye my fabric and I discharge my fabric so that’s… I mean I try my very best not to buy commercial fabric. Not because I don’t like it, ‘cos I love some of the designs and things but I don’t know whether they’ll fit in with what I’m hoping to make so I try very hard now not to buy unless I have a specific project in mind like when I made my granddaughters their quillows I did buy their fabric because I knew that they both wanted pink, so they both had pink quillows. But I usually buy from shows like Festival of Quilts or then there’s the Knit and Stitch and the Olympia in March, then there’s Ali Pali in October. So they’re the three sort of places but if you go to Area Days they’ll always be somebody selling fabric and I really will myself to be strong and not get anything because there’s a limit to how much you can keep buying . AS: Has the, do you use the Internet at all with your quilting? AS: For shopping, or to research or community or? KB: Yes. No, I mean Contemporary Quilt have a group website and they’re also like a chat, ah, chat is the wrong word but they have the yahoo… they have a yahoo groups website there so they put photographs up there and they also chat about various aspects. Somebody finds some link or the other so they send it so. Yes, in that way I always look at that now and then. I sometimes check if I want to see fabric, specific fabric, black and white fabric or fabric which has cats or music or something I might surf for that. I also get emails from Interweave in America which has Quilting Daily and Cloth, Paper and Scissors or Cloth and Scissors, I can never remember what they’re called. So that’s one mixed media, one’s quilting, so that, I sort of look at their emails regularly and see what’s new and what’s what. I will buy black or white fabric online if they have a good offer or I need it desperately but that’s about it. I do online courses but they’re not necessarily about quilting. There’s a lot you can do on the web and of course YouTube tell you how to make certain things without you having to leave your chair or your house. So it is good for that. AS: You’ve already said about other people’s quilts and friends of yours. You’ve got that you admire different things that they do, what makes a good quilt for you? KB: The visual impact, the colour, and whether when you see something you either say ‘oh yes, let me go and look at it close up because I want to see the texture, to see the sewing, how did she do it?’ all those various things. I think it has to appeal to you visually because if it doesn’t you’re not going to go further are you? I mean I don’t make very colourful hangings but I appreciate people’s, people who can use that facility to such great advantage. One of the ladies I interviewed last week, I mean she can use colour amazingly. She has a great affinity with colour and she knows exactly how to use it to advantage. It’s a skill. AS: In your quilt here it’s colour but also texture [KB: yes] that you want to look for, but also feel. KB: Feel. Yes but I think fabric is tactile. It is very much, mm. I mean I love stroking fabric. There’s something, because you can tell if, you know, the silk has a completely different feel to cotton or you get coarse cotton, smooth cotton, a variety of things. AS: Is there anything else you want to say about this one that I haven’t? KB: No, I don’t think so. I think it’s a very personal piece but it’s something that most people when they see are drawn to it because they can’t, they want to go closer and see the different bits that are in this hanging. I think it’s one of my successes. AS: Will you keep it up here? You said about sometimes you change things around. KB: Yes I do. Every few months I take this one off and put another one as long as it fits on the same pole they do change. AS: I think that’s lovely, you’ve got a changing exhibition in your house [KB laughs] You get to yeah, change the displays. KB: Yeah, that one on that wall doesn’t move. It is a quilt, it is a hanging, well it’s a piece of fabric which was serendipity that one. It happened [AS: It’s one piece? Wow]. It’s one piece. That one’s completely hand stitched and machine quilted so yes, my younger daughter’s got her eye on that one. She’s been wanting it for years and she keeps saying that I haven’t allowed her to have it. She’ll get it eventually but not at the moment. AS: So this big question that comes at the end is why is quilt making important to you? AS: What is it about quilting in particular do you think that gives it that capacity to really draw you in to that? AS: I think, I want to ask you more because I think it’s just wonderful. The way that you talked about the kind of the way that it’s changed and your life has been shaped by it. And that sense that it’s about quietness and peace I think you said. But it’s also really social and fun [KM: ah yeah] It’s both those. KM: Of course it is. I mean I went to San Mario Mean in September thanks to my friend and we went, that’s where the European Patchwork in France is held every year and its spread over four little villages near Alsace and it’s amazing, it really is. It was such fun. You know, they had funny little frogs in the gardens pointing to where the exhibitions were. It was just great! Because it’s a completely different aspect of quilting and patchwork, completely different. The Europe, I know we’re supposed to be from Europe but the real European, sorry ladies [laughs] I mean they’ve embraced patchwork and quilting and taken it their own dimensions. I think this is what’s so interesting because we all do very different things. It’s our own, unique thumbprint. It’s not only ours, it’s each country’s thumbprint and yet you all unify because you like it. I’m sure if the leaders of our nations sat and quilted and did embroidery or knitted they might not be so frustrated and take it out on all of us. Churchill used to knit you know that don’t you? [AS: did he?] Yup. He used to knit in between working out how he was going to save the United Kingdom. Seriously! He used to knit in the Cabinet Rooms. So, and people, I mean I’ve seen it in the papers that people have said that it’s one of the most therapeutic things is to knit or to quilt. Because you know you can’t, because you’re so busy concentrating on what you’re doing with your hands. I think it is a great form of therapy. Makes you concentrate. And I think it’s very good, very good for all of you, for all of us. AS: Have you found that in difficult times in your life that you’ve found it therapeutic and helpful? KM: Possibly, yes. I mean I’ve always said that I don’t do meditation, I’d rather just go and stroke a piece of fabric ‘cos to me that’s therapeutic enough. AS: You have to be careful as well, don’t you and it takes time to invest yourself in something I find. KM: Careful in what way? KM: No, no, yes, also if you’re playing with a rotary cutter [AS laughs] you definitely need to concentrate or you’ll cut your finger off. My friend did, she cut the tip of her finger, not because she wasn’t concentrating and I can’t remember what she did poor thing but she chopped the tip of her finger, yeah, horrible. We were all there. [AS: oh] [KM laughs]) yes, and then at one workshop this woman went and machined her finger [AS: oh] that was awful too. So yes we’ve got some [AS: there’s lots of sharp objects] yes! So you have to concentrate I’m afraid and certainly if you’re wielding a rotary cutter or a blade or something. Not good. But you know, we’d be lost without our rotary cutters, we really would be. Probably one of the best things they’ve ever brought out ‘cos it makes things so fast. AS: What took it so long? KM: What took so long? Who knows? You’ll have to ask Mr Olfa! No idea. But they’re here to stay. Do you quilt? KM: Don’t worry, everyone has to start at the beginning [AS: mm] Well if you’re a beginner you have many years of joy ahead of you. [AS: I hope so] I’m sure you will. Now neither of my daughters quilt but I’m hoping that my little grand-daughter does. But they’re very sweet. As I said they’ve both got a quilt hanging on their walls because nowadays people don’t put them on the beds until they’re much older in case of health and safety. And they’re both very different, but they are traditional ‘cos that’s how it should be for a quilt that will eventually go on your bed but it’s not completely traditional. Even [AS: give it a twist] oh yes, Eva’s quilt has got twelve funky angels, one for each month of the year, and then little squares all over the place. It’s a lovely quilt and Maya’s is a copy of one that was at Shelburne in America and its got hand embroidered flowers as well as nine-patch. So both very different, both very nice and I hope they enjoy it. AS: Have you shown them it? How old are they? Seven and? KM: She’s Maya’s seven and Eva will be five next week. AS: Have you done any sewing with them? KM: It’s very hard, they don’t have that sort of concentration level and I’m not going to push it. You don’t do it when they want, they have tried. They’ve both got one Little Mr Men cushion and one Little Miss Cushion which they chose and they’ve both done one hand. That’s as far as we’ve got. [Both laugh] So, well there’s plenty of time. You shouldn’t push a child ‘cos they’ll never like it. They are very sweet. I think because they’ve seen me doing things as soon as they could remember to them it’s no novelty. I’ve always done it. I’ve never taken my machine down. They’ve had to learn to accept it as part of the furniture which is the way to do it because if you keep saying ‘don’t touch it’ you know I’ve got to put it away, they know that it’s not a toy and that’s all they need to know. Because it’s always unplugged, it’s never plugged so they can’t hurt them like that. Try to remember to put the presser foot down so that little fingers don’t catch in the needle. But they are very good, they don’t, by and large they don’t sort of stick their fingers where they shouldn’t. AS: That’s lovely, for them to have something in their rooms that’s come from you and you’ve made especially for them [KM: yes, it is, it’s for them] and they’ll have it for ever. KM: Well I hope so unless they decide to take the rotary cutter to it or something [both laugh]. No it’s theirs. I wanted to make, well my daughter wanted for me to make something for them while they’re and I’m glad that I have because you never know how long my hands are going to be strong enough to do something that big. They’re both large quilts, they’re well, Maya’s is definitely a large single, and Eva’s is probably a double so they’ve got it for their life-time. They can have another one later on if they want. I still have to make a quilt for my own daughters, forget about the grand-daughters! I’ve got to make one for each of them. That’s the next project. AS: How would you develop ideas about what you were going to do for them? KM: No, I’d ask them. My younger daughter I think is very keen on having like a wholecloth but not a wholecloth, I wouldn’t be able to do a wholecloth now, to sew such a big size. But a friend of mine at Dulwich Quilters she did a white double quilt for her son and his wife for their silver wedding anniversary last year and that’s all in squares, blocks that have been stitched together so that’s a thought. KM: Wholecloths is basically [AS: one sheet?] one whole piece, yes. Which is then [AS: quilted] quilted. AS: What about the other one? KM: The elder daughter? I don’t know. I’ll have to ask her. She might just let me do what I want. So we shall see. AS: So is there anything that I haven’t asked you that you’d like to say about? KM: No, I don’t think so. I think you’ve asked me too much! [Both laugh] I’ve been rabbiting on for ages! AS: That’s the idea! Shall I stop it?